158, 3.73 Hispanic URM Chances? Re applicant here. Applied late last cycle (March) with a 157, and was only accepted into GW... Scared of debt. I added legal experience at a decent law firm, an LOR from a law professor at one of the schools I am applying to, and revised my PS. What do you guys think my chances will be this time? I applied to UCI, Texas, Boston College, WashU, Fordham, and Notre Dame. Re: 158, 3.73 Hispanic URM Chances? 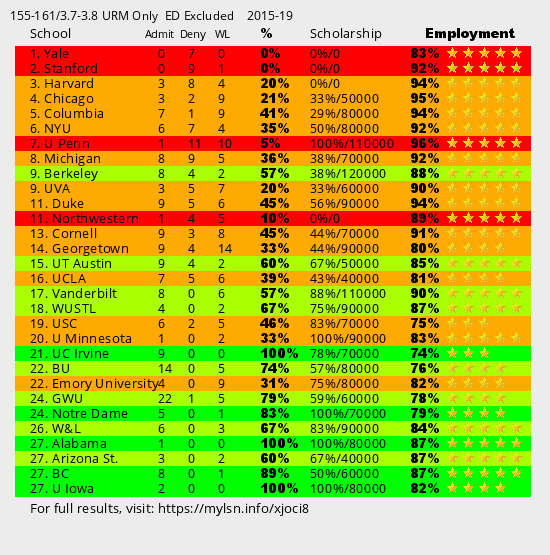 It looks like you should be targeting the T20, particularly UT, Vandy, and WUSTL. You might also try some of the lower T13s. Have you retaken the LSAT? If not, why not? There is much room for improvement over a 158 LSAT. If you can get into the 160s, you'd be facing a totally different ballgame.